What really fuels breed discrimination? A recent social media drama has me thinking quite a bit about what it is that causes breed discriminatory laws to be passed. The crux of the issue that sparked this post was the claim that mis-labeling dogs as pit bulls is the reason breed discriminatory laws are passed; that when people mis-identify a dog as a pit bull bite, stats are inflated and, as a result, BDL (breed discriminatory legislation) is passed. There was a time when I thought the same thing, that BDL was caused by inflated statistics. I don’t disagree with the idea that people should only call dogs with a verifiable lineage by a breed name, or in this case nickname, but the longer I work towards breed neutral communities, the more I realize that there is no reason for breed discriminatory laws. When I say reason, I mean fact and statistic. These laws aren’t based on statistics because even in areas where dogs identified as pit bulls feature heavily in bite stats, they are still the minority of the percentage of bites over all. It is the rare town that even considers BDL these days, and even rarer still is one that considers it based on bite rates. So what is really driving these laws? It is a complex issue that varies from municipality to municipality but the bottom line always comes down to one thing, there is the mistaken perception that targeting dogs by appearance is a simple solution to a complex issue. Mostly it isn’t even about dogs but people. We have seen over and over again references to “those people” who own pit bulls and the idea that bad owners can’t be removed from a community but the dogs can. A few examples. Clay, Alabama passed their breed ban because officials read an article about pit bulls being a problem. There were no attacks in the city. Moreauville, LA, passed a ban because officials had issues with menacing dogs and they couldn’t remove the owners from the community, so they went after the dogs. Minot, ND, there was a fight between 2 dogs and neither was considered a pit bull even under the broadest definition but they passed a ban on pit bulls because of the hysteria surrounding the dogs in the late 80’s. Ontario, Canada, passed their ban after a fatality by a dog that was not a pit bull. Aurora, CO, passed their ban after Denver’s ban was upheld for fear of “those pit bull owners” moving from Denver into Aurora. In Boston, MA, after the state prohibition against BDL was passed and officials were trying to keep their BDL but a freedom of information act request revealed they had no data, despite claims by officials. Boston animal control openly admitted at the hearing that they needed BDL to “go after the bad guys.” This is just a small sample of what I can remember off the top of my head, the examples go on and on but a pattern emerges. Breed discriminatory laws aren’t based on any facts but rather on a feeling. Aurora, CO, councilwoman Molly Markert admitted exactly that while the breed ban there was put up to ballot. It is a feeling of doing something, even if that something doesn’t work. It is a feeling about the owners of a dog whose roots are less than savory. The perfect recent example of the effects of this clause is from Camdenton, MO, where 2 registered American Bulldogs are considered banned because they meet 5 out of 8 criteria on the city’s checklist. The label of the dogs doesn’t matter to officials. What matters is what they look like. 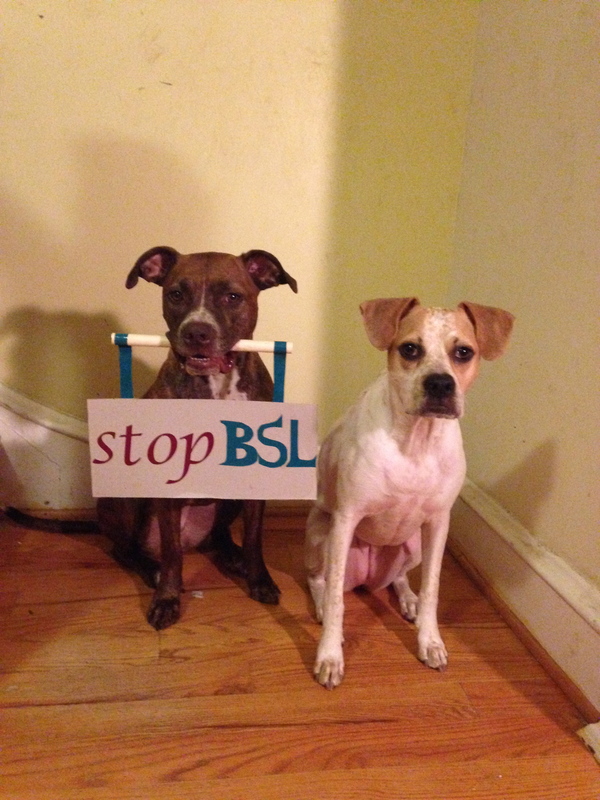 Labels don’t protect dogs from BDL and neither do papers in many cases. Labeling is an issue. It is an issue from a public perception standpoint. It is an issue because of media reporting which fuels that perception but even that is changing drastically. Labeling is an issue because those who claim only APBTs are pit bulls when one does something wrong are the first to turn around and claim a hero dog story is a pit bull. Labeling is an issue because some groups have made it into a divisive way to wage war on others who are on the same side of the larger issue. However, labeling is not the issue or even on the list of top ten for why BDL is passed. We must move past the classical rhetoric about BDL and have an honest conversation about what needs to be done to promote safety in every community. This entry was posted in Advocacy and tagged american bully, american pit bull terrier, american staffordshire terrier, bdl, breed discriminatory legislation, breed specific legislation, bsl, bull terrier, pit bull by krisdiaz9. Bookmark the permalink.